The internal republic in southern Siberia attracts travellers with its gentle steppes and southern mountain ranges, ancient shamanistic culture, and traditions of different ethnic groups. A patient old woman paces back and forth near a squat wooden house. She is waiting for bread. “Good morning! You want two as usual?”. A small truck drives up to her house and the driver is smiling as he opens the door of his vehicle. The frosty air is filled with the smell of fresh bread. Bread is brought from neighbouring Efremkino to the village of Malaya Siya, which is tucked away in Khakassia on the banks of the Bely Iyus River. Buses go twice a day from Abakan to Kommunara with a stop in Malaya Siya. The ticket costs 330 rubles (USD 9.40). By car you can drive to the village from Krasnoyarsk or Tomsk along different routes, but you must pass through Shira, and there, without going through the district center itself, turn right onto the road leading to Kommunar. 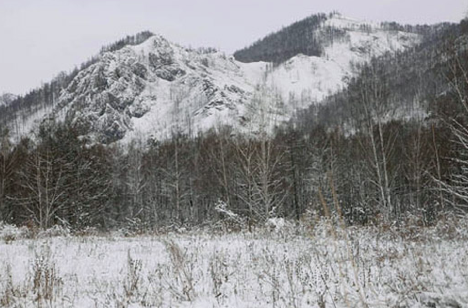 This modest village, which is surrounded by ridges of the Kuznetsk Alatai, seems practically uninhabited. During the day there are just dogs and horses wandering about, and in the evening there is light in just two or three of the huts. In Soviet times, this village was home to auxiliary facilities for the Kommunar gold mine. But after that collapsed, all that was left was a facility for baking bricks and lime. On weekends the club showed movies, and the village shop had canned goods and condensed milk on hand. Today about 15 people live in Malaya Siya, and groceries are a long forgotten memory. But this seemingly inconspicuous corner of Khakassia is well known to any spelunker in Siberia. There are more than 40 caves of different levels of complexity that can be explored around Malaya Siya and Efremkino. According to Oleg Dobrov, a Novosibirsk researcher, "there are those that can be entered by simply bending over slightly, and those where you would need to rappel down tens of meters." Over holidays and summer vacations, adult speleo-tourists come to Malaya Siya as well as college students and school kids from Novosibirsk, Tomsk, Krasnoyarsk, Irkutsk and other Siberian cities. And then the village is filled with sounds. The local caves were first mentioned in the works of scientists of the 18th century, and a station of the Permafrost Institute of the USSR Academy of Sciences Siberian Branch was located in Malaya Siya until 1982. So it turns out that this place hidden in the hinterlands of Khakassia was a large-scale scientific platform and discussion arena during the Soviet era. In 1975, Novosibirsk archeologist Vitaly Larichev discovered an ancient human site dating back to the upper Neolithic period. The approximate area of the settlement is 2000 to 2500 square meters. During the excavations a scientist found a large collection of stone tools, and bones from deer, Siberian ibex, bison and other animals that were hunted by ancient people. If you've never been in a cave, but would like to try, it is better to look for an instructor at your local speleological societies and clubs, or contact local ones there. Tomichka campsite is in Efremkino (which is located near Kashkulakskaya Cave) and experienced instructors work there. You can contact its manager, Marina Zhuchkova at +8-952-745-1617. In the village of Malaya Siya you can call Elena Rudenko (tel. 8-913-058-3526). You can also rent a small but cozy cabin from Elena with a stove, bunk beds, and a big table for 150 rubles (USD 4.28) a day or stay at Peter Osipovich's Gostiny Dvor, which has a kitchen, bathroom, and bed sheets and costs 500 rubles (USD 14.26) per day. Elena Rudenko is the custodian of the small museum collection of Malaya Siya that teacher and Efremkino school director Fedor Kirillov and Tomsk scientist Vladimir Dmitriev began to collect back in the 1950's. In Soviet times, the collection was housed on small shelves of its collectors, and later was moved to an old house. Today, the village museum, which looks more like a warehouse of assorted antiquities, is considered a must-see for all visitors, including experienced spelunkers, leisurely tourists, and curious students. Here you can see a femur of a cave lion, a tooth of a cave hyena, or a skull of a young bear. They've got stalactites and stalagmites, as well as rare and endangered species of bats. Elena herself spends a lot of time underground. She monitors the number of bats (known by their scientific name of Chiroptera) in Archaeology Cave. She reports the results of her research to zoologists at Tomsk State University and interested scholars. She and her husband Peter, who runs an inn in the village for visitors, are building a new structure to house the museum all by themselves. This village has long been a popular speleological site, but there should be something not only for the muscles and the camera shutter, but also for the head and imagination. At Malaya Siya there are caves of average complexity like Archaeological Cave, where they take even school children, as well as very advanced caves. For example, Pandora's Box Cave, named for the ancient Greek myth, is the second longest in Siberia after the Bolshaya Oreshnaya in Mansky District, Krasnoyarsk Krai. This cave is a cascade of grottos, slopes, and wells and stretches down nearly two hundred meters. The whole system of galleries and passageways holds about 400 lakes with a depth of up to 50 meters. Over the past 25 years three people have died in the cave. There are memorial plaques of cavers hanging at the wide entrance to Pandora's Box as a reminder that it is dangerous to enter such a difficult cave without a reliable instructor and experience. Kashkulakskaya Cave, or, popularly, Chyornogo Dyavola (Black Devil) Cave, is also one of the most popular in the Malaya Siya area, but less difficult. This archaeological site is relatively small. The cave is 820 meters long, and only 50 meters deep. Once Kashkulakskaya Cave, like most caves in these parts, was the site of sacred rituals. Since the Stone Age shamans, hunters, the inhabitants of the taiga and mountain people have performed various ceremonies and sacrificed animals here. Weighted down with kilograms of caving equipment, we turn on our headlamps and delve into the dense and frightening darkness of Kashkulakskaya Cave. The interior of a cave is unlike any other place. Here the last ray of sunlight disappears, and the maze of an unseen, damp city begins with clay and stone streets full of physically tangible darkness and a silence that hovers under the domes of the caverns. It is difficult to get your bearings here. The rock that forms the wall of the Kashkulakskaya passageways, galleries, and even the dripstones, is absolutely black. The only creatures that live in this darkness are the bats. In Enthusiasts grotto, which we accessed by climbing a rope down 25 meters, the bats are not immediately noticeable. They are like shaggy black dots, anchored by their claws to the rough walls of the cave, quietly hanging upside down. You should never enter a cave, even the easiest one, without an experienced instructor, since you will need at the very least special equipment and clothing, not to mention the ability to safely make it through the difficult parts of the route.